The number of BIM file formats and the number of available software packages makes it difficult to ensure that true collaboration can take place. To assist, we have compiled a matrix between architectural authoring software and coordination & review software. It is possible to view a larger version of by right clicking on the image which provides you with the option of saving locally or opening in a new tab. 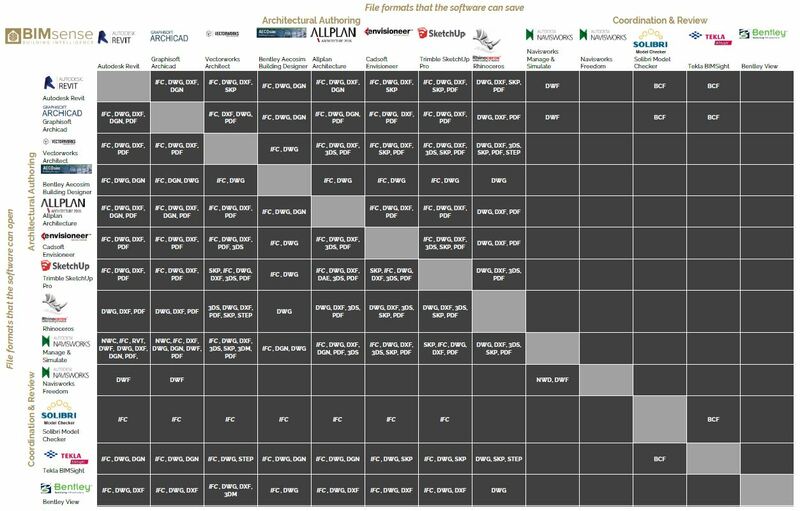 The matrix has been compiled using available information from the software vendors. However, compatibility should be checked before committing to a software package or your preferred method for collaboration. Update 17th Jan 2017 – Thank you to Peter Saal for feedback on the STEP format, which is fully compatible between Rhino CAD and Vectorworks Architect and Tekla BIMsight is able to import STEP files. The STEP format is important for projects requiring MCAD (mechanical) importing of product geometry. Although, the LOD from MCAD applications will usually be higher than required for most BIM project and will require reducing. Please contact us if you find any of the above to be incorrect or if you have any additional information that can add to the usefulness of this matrix.